Did you know there’s a new Razer Blade out there? Check out our Razer Blade 2019 review. The 2018 Razer Blade marked a huge revolution for Razer’s thin and light device, already one of the best gaming laptops. Razer abandoned the 14-inch model for, well, another 14-inch Razer Blade this time around, technically speaking. With the Razer Blade 2018, Razer has managed to shove a 15.6-inch display into a 14-inch chassis, similar to the the best Ultrabooks – not to mention the Razer Blade Stealth. This results in the smallest 15-inch gaming laptop to date, at least until the Razer Blade 2019 hit the streets. The Razer Blade 2018 was redesigned from the ground up, and honestly, we’re impressed. The Razer Blade 2018 arrived among a laptop scene that’s completely evolved over the years. In that time, the competition evolved, and is now made up entirely of similar gaming laptops, which begs the question: is the Razer Blade 2018 worth the attention? Razer has priced the latest Blade similarly to its previous laptops – somewhat exorbitantly. The 2018 Razer Blade starts at $1,899 (£1,699, AU$2,899), which gets you a full HD (1,920 x 1,080) display at 60Hz powered by the same processor as the other versions, though paired with an Nvidia GTX 1060 and 256GB of storage. There’s a new ‘Base’ dual-storage model of the Razer Blade, that’s a lot like the starting model, but with both an SSD and HDD. This dual-storage Razer Blade will set you back $1,599 (£1,479, AU$2,499) with a 128GB SSD and a 1TB hard drive. You can get up to a 256GB SSD paired with a 2TB HDD for $1,799 (£1,649, AU$2,799). To get the model that we reviewed here, you’ll have to spend a huge $2,599 (£2,329, AU$3,999). In between that is a model with the 144Hz display, the GTX 1060 and 512GB of storage for $2,199 (£1,979, AU$3,299), and one with everything you see on our spec sheet, but with less storage for $2,399 (£2,149, AU$3,699). Similarly, the pricest version of the Asus ROG Zephyrus GX501 will set you back $2,899 (about £2,199, AU$3919), getting you a stronger GTX 1080GPU as well as Nvidia G-Sync – all else is the same. The entry level version costs $2,299 (about £1,749, AU$3,100), with a GTX 1070 behind a 120Hz display. To get the same graphics card in the Razer, you’ll have to drop another 100 bucks or quid. At the same time, the MSI GS65 Stealth – also updated at CES 2019 – comes in at just $1,799 (£1,790, AU$2,599) at the entry level, with the same processor as the Razer Blade’s starting option, only with a faster 144Hz display. At the highest end, the GS65 doubles the Razer Blade’s storage and memory for $2,999 (£2,349, about AU$4,080). It’s not hard to find the same hardware for less cash in a less flashy chassis. It’s not enough to convince this editor to cough up the extra cash, but we’re not everyone. Still, the new Razer Blade is the best looking gaming laptop we’ve seen from Razer. Still clad in an all-black, unibody aluminum shell, the Razer Blade adopts a far more angular shape this time around, while toning down the lighting to just the keyboard and Razer logo on the lid. Simultaneously, Razer has put a lot of effort into slimming down the Razer Blade, with the manufacturer claiming to have made the ‘world’s smallest 15.6-inch gaming laptop’ at 0.66 inches (16.76mm) thin on the GTX 1060 model. It also comes in at under 14-inches wide, thanks to a new, thinner screen bezel. 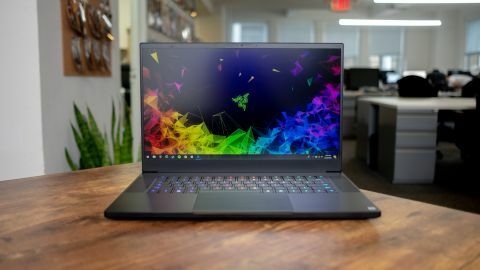 Fortunately – and other laptop makers, listen up – the Razer Blade keeps the webcam to its proper position above the screen while implementing narrow bezels. Still, even with how thin the Razer Blade is, it’s surprisingly dense – coming in at half a pound heavier than the MSI GS65 Stealth. While Razer has also managed to reduce the size of the charging brick, it’s still heavier overall than comparable thin and light gaming laptops, and it was heavier than we’d have liked. Beyond an intense streamlining, the Razer Blade design is much of what was found before, only larger. Of course, the keyboard feels fantastic, offering some of the punchiest feedback and smooth travel we’ve experienced on an island-style keyboard. However, the key layout is somewhat baffling, with the ‘up’ arrow key sitting between the Shift and ‘?’ keys. This has made typing out questions a major pain, as we constantly hit the up arrow in haste, adding a question mark to the line above where we are typing. We would handily take shrunken arrow keys if it meant a more sensible layout otherwise. The trackpad finds itself in a similarly unfortunate situation. While we’re celebrating the fact that Razer has finally implemented a clickpad design, dropping those flimsy buttons like a bad habit, the tracking surface is perhaps a bit too wide. We often find ourselves accidentally moving the cursor when typing. Otherwise, it’s a smooth and accurate Microsoft Precision tracking surface. Finally, while we appreciate the top-firing speakers for their much fuller sound than most other notebooks, we’re a little puzzled by the lack of Windows Hello secure login options. Razer even included the perfect placement: a rectangular power button now rests atop the right speaker and feels smooth to the touch. At this price, secure login should be a shoo-in. Razer knocked it out of the park when it comes to the Razer Blade’s display. With a matte coating that does well at deflecting light clare, this panel may only be 1080p, but it’s simply gorgeous. A lot of that comes down to the 144Hz refresh rate, which makes games look extremely smooth as the refresh rate outpaces the frame rate of most games ran on the device. This allows the Razer Blade to shore up potential shortcomings of the GTX 1060 or 1070 in producing consistent frame rates at high detail settings. The 100% sRGB color gamut also helps the display just pop with a wide variety of colors supported at impressive accuracy. The factory screen calibration that Razer gives to all of these laptops goes a long way, too.